As many homeowners know when who living in Texas, the weather can be brutal. The humidity is unbearable that you just want to stay home all day to keep yourself cool. 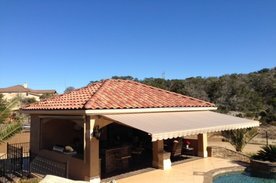 Our team at Texas Custom Exteriors recommends you invest in a quality retractable awning to enjoy most of the sun. Here are five reasons you should have them installed today. Protects your outdoor elements. Investing in awnings is a great way to protect your outdoor furniture. It provides shade it certain areas of the house meaning any furniture or fabrics that are exposed to the sun will not deteriorate by drying out or from it being wet from the rain. Saves money. Retractable awnings can be pricey, but if you think of it as a long-term investment, the retractable awnings will pay for themselves as they provide shade to the interior home which means air conditioners are not often as used due home being cooled, resulting in lower electric bills which add up to significant savings. Customizable fabrics. Awnings have fabrics that come in all different colors and styles that can either blend in with your home exterior or makes your home stand out from the rest of the crowd. Creates a comfortable vibe. With the shade, no matter if it is blistering hot or pouring down with rain, you can still enjoy relaxing outside without any concerns. For more information with Retractable Awnings, please feel free to reach out to us at 210-691-9300 for a free consultation or fill in our online contact form!